In 2013, the city of Dijon purchased a 160 hectare agricultural property called Domaine de la Cras, located just outside the city limits. The former owner has already built a winery and planted 8 hectares of vineyards (5ha red and 3ha blanc) on land classified Bourgogne AOC, with a possibility to plant an additional 13 hectares. An open call for proposals was held to decide who would take over the winemaking -the primary criteria were that the vineyards had to be farmed organically, the winner had to be a young winemaker with no existing family vineyards, and be interested in opening the domaine to the public for educational visits. 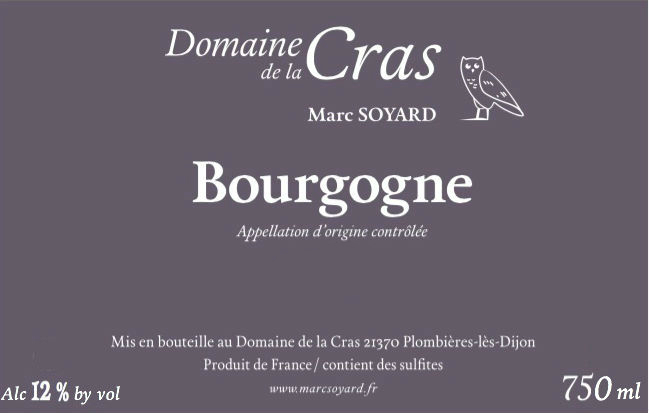 After Marc Soyard was chosen, he was given free reign to live on-site at the domaine, tend to the vineyards, and produce and sell his own wines - on the condition that he pay a yearly “rent” of 2000 bottles per year to the city of Dijon. Originally from a non-winemaking family in the Jura, Marc worked for six years at Domaine Bizot in Vosne Romanée, as chef de culture (vineyard manager), and also working in the cellar closely with Jean-Yves Bizot to learn the winemaking process. Marc has adapted the same hands-off, natural philosophy to Domaine de la Cras that he learned at Domaine Bizot. All of the vineyards are farmed organically with some biodynamic practices. Depending on the vintage, the reds are partial whole cluster or 100% whole clusters. All vinification is done with natural yeasts, and minimal addition of sulfur. Elevage is traditional in a mix of new and used barrels, with frequent experimentation using different types of wood in small amounts including the traditional oak from various forests, as well as chestnut and acacia barrels. The official appellation at the domaine is Bourgogne AOC, but the Domaine de la Cras is the sole producer allowed to use the designation Coteaux de Dijon. 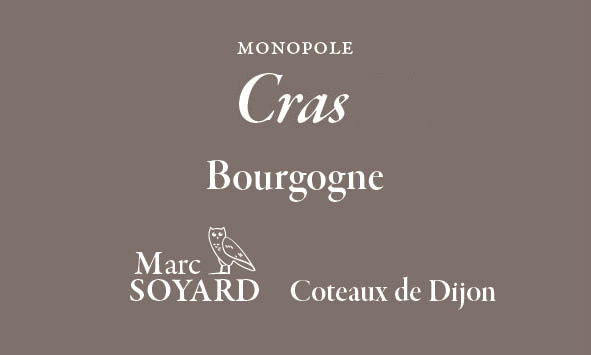 The Domaine de la Cras produces two reds and two whites. The cuvée “Coteaux” comes from the lower elevation vineyards, while the cuvée “Cras” comes from the steeper, better exposed vineyards and has a longer elevage. 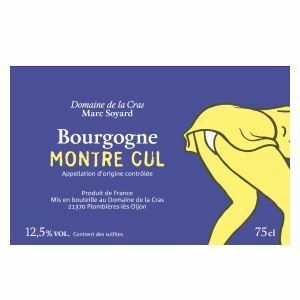 Marc Soyard also personally owns two small parcels of Pinot Noir further south in the Cote d’Or - one vineyard of Bourgogne Rouge near Ladoix which he names Hermaion, and a second parcel of in the Haute Cote de Nuits. In addition to the winemaking, the city of Dijon has chosen other young agriculteurs to run other projects at the remaining 140 hectares of the Domaine de la Cras. 33 year old vines are manually harvested with sorting done at the vine. Pressurage with a pneumatic press, and separation of the press runs: free-run juice, juice from the rebêches and last juice. Very small amounts of SO2 added at bottling. Settling. Vatting and fermentation in barrel. Elevage for 10-12 months. Unfined and unfiltered. 33 year old vines are manually harvested with sorting done at the vine. 1/3 of grapes are put whole cluster into wooden tanks without any SO2. Semi carbonic fermentation of the whole clusters with punch-downs. 2/3 of grapes are pressed but not destemmed. Very small amounts of SO2 added at bottling. Pump-overs and punch-downs. Elevage in barrel for 10-12 months. Unfined and unfiltered. 33 year old vines are manually harvested with sorting done at the vine. Pressurage with a pneumatic press, and separation of the press runs: free-run juice, juice from the rebêches and last juice. No SO2 added. Settling. Vatting and fermentation in barrel. Elevage for 15-18 months. No fining or filtering before being bottled. 33 year old vines are manually harvested with sorting done at the vine. Whole cluster into wooden tanks without any SO2. Semi carbonic fermentaton of the whole clusters with punch-downs. Elevage in barrel for 15 - 18 months. No racking, fining, or filtering. Minimal SO2 added at bottling. 60 year old vines are manually harvested with sortingdone at the vine. Whole cluster into wooden tanks without any SO2. Semi carbonic fermentaton of the whole clusters with punch-downs. Elevage in barrel for 15 - 18 months. No racking, fining, or filtering. Minimal SO2 added at bottling. 4,5 Hectares on clay-limestone soil in Bessy. Vines were planted between 1983 and 2001. Vinification with native yeasts and short maceration. Ageing during six months in tanks without any sulfur addition. Cuvée l'Equilibriste was initially created for a local circus festival around Dijon, thus the high wine "razor's edge" balancing act on the label. 4,5 Hectares on clay-limestone soil in Bessy. Vines were planted between 1983 and 2001. Semi-carbonic vinification in whole cluster and ageing during 10-12 months in barrels. No sulfur added. Cuvée l'Equilibriste was initially created for a local circus festival around Dijon, thus the high wine "razor's edge" balancing act on the label.